Jolie Maxtin: Let's Build our Skills Together! I'm not sure I can keep up but I am going to give this BOM a try. The blocks look very interesting. This looks fun! I've never done a BOM, and though I was interested, I didn't want to join one just to join one. 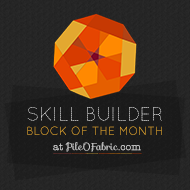 But this one, with its skill building format, looks awesome! Thanks for the heads up.